A hermetic compressor (also known as a hermetically-sealed compressor) is a type of compression system commonly used in refrigeration. The compression process, as used in domestic and commercial refrigerators, has two main elements; firstly, the motor, and secondly, the pump which is driven by the motor. In a hermetic compressor the motor and pump are integrated so that the rotary shaft of the electric motor extends beyond the coil and also forms the crankshaft of the pump. The pump itself could be any one of several types used for gas compression, although in a typical application such as domestic refrigeration, the choice will be determined by issues such as price, noise levels and reliability. The reciprocating pump, which works with a cylinder and piston arrangement, is commonly used, although rotary types, which are considered to be quieter and more energy efficient, are also becoming widely available. Both motor and pump are sealed inside a casing, usually made of two steel halves which are welded together. This seal prevents the leakage and loss of refrigerant gas, which depending on the gas used could be toxic and/or environmentally harmful, but in any case will always be expensive. The casing is part of the pressurised gas system, so the motor acts within the gas envelope. Because the steel case can not be opened, no servicing or maintenance is possible in a typical hermetic compressor. There is an inbuilt lubrication system, and the refrigerant also acts as a coolant on the motor. As a self-contained system the hermetic compressor is generally reliable and long-lived. However, in the event of breakdown there is usually no way to repair the compressor, and the whole unit is normally replaced, which may be a disadvantage in terms of cost. 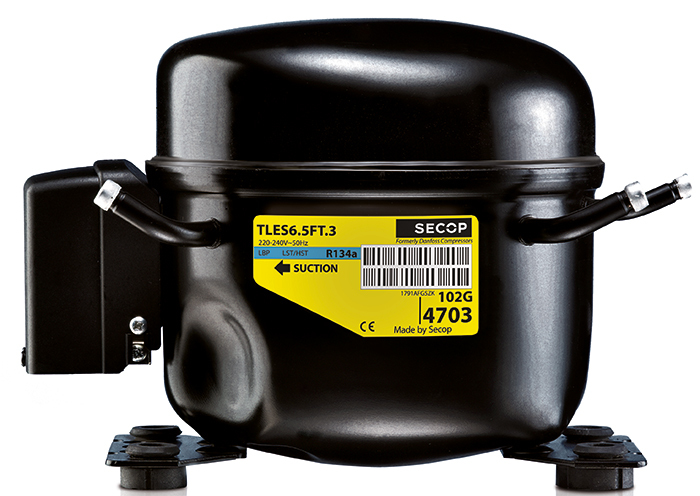 Another disadvantage of hermetic compressors is that there is no real alternative to the electric motor as a power source, which limits their application to settings in which a reliable electricity supply is available or can be generated. Nevertheless the hermetic compressor is an efficient and trusted element of refrigeration technology.